Van Gogh’s use of color, texture and movement make him the perfect artist to introduce to children. Vincent Van Gogh was born in Holland in 1853. He was part of a group of painters called Post-Impressionists. Artists during this time painted colors that expressed their emotions rather than portraying a realistic object. Van Gogh painted seriously for about 9 years and painted almost 900 paintings. Sadly he only sold one painting before he died at age 37. Note: Do not purchase this bundle if you are an active member of The Sparklers’ Club. This Bundle is included in the membership. 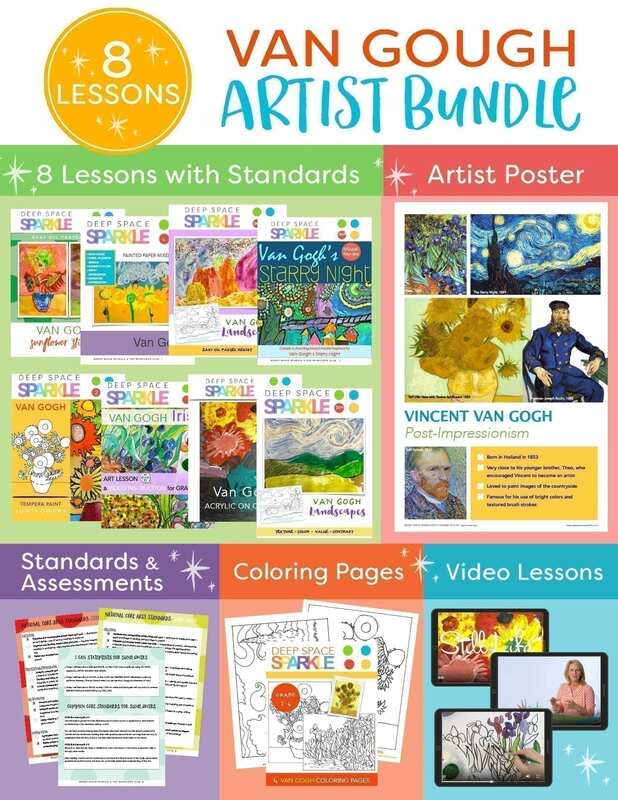 This bundle includes everything you need to teach at any age grade (K-6) about Van Gogh’s art, even if you are not an artist. This bundle will walk you through how to teach kids to draw Van Gogh’s most influential pieces of art and how to paint like Van Gogh using supplies you have at home or in the classroom as well as offer you drawing guides that make the process so much easier. This lesson bundle uses these basic supplies: chalk pastels, oil pastels, tempera paint, and acrylic paints. Don’t have any of these supplies? I always suggest alternate ways to color or paint a drawing. Use the worksheets, printable poster and coloring pages/drawing guides to make teaching easy. 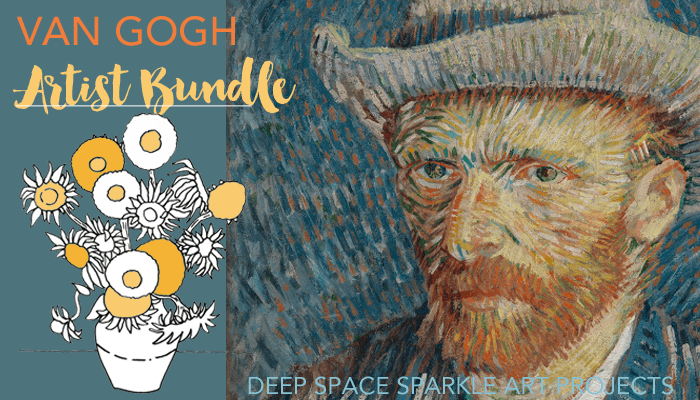 The 8 lessons in this bundle are based on some of Van Gogh’s most famous works of art: The Starry Night 1889, Irises and Vase with Irises, Sunflower Series, Wheat Field with Cypresses 1889.